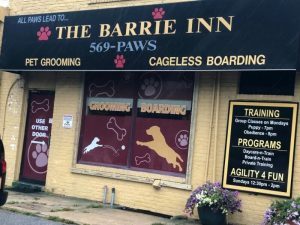 The Barrie Inn Long Island's Best Dog Grooming & Doggy Day Care. All Paws lead to The Barrie Inn, located in Woodmere, NY, the finest dog grooming on Long Island. We specialize in all dog breeds let us know if you want a show cut or a puppy cut and our professional groomers will pamper your pet and give him a grooming of your choice. Do you have a CAT? Cats need grooming too. Going away or doing work at your home, leave your precious family pet member with us in our safe, comfortable, loving, cageless boarding environment. We offer social interaction and healthy exercise in a safe cageless boarding environment for all size dogs on a daily, weekly or monthly programs available Check out our Doggy Day Care in Long Island’s largest Doggie Daycare facility on Long Island.